After Arcade Fire's performance on Saturday Night Live a couple weeks ago lead singer Win Butler smashed his guitar. In this day and age when a band destroys their instruments you assume it is done in a Spinal Tap-like send-up of rock and roll excess. But, since Arcade Fire is probably the least ironic band in the history of the universe, I'm pretty sure Win Butler meant it -- whatever it means. When they aren't destroying the tools of their trade, Arcade Fire has worn their stone-cold seriousness well. Their lyrics of overwrought love and loss, childhood fairytales, Bogeyman and vampires would be too much if you read them on paper, but are sold with conviction and an utter lack of self-consciousness. They also had the perfect sound -- a big, huge pick your-influence wall of it -- to back up Butler's full-head-of-steam vocal delivery. Two of their influences -- David Bowie and David Byrne -- adopted the band's debut album, Funeral, a few years back and helped propel the Montreal band to hottest-ticket-in-whatever-city-they-play status. But Arcade Fire's latest release, Neon Bible, is not worthy of the pedestal they've achieved and deserve. It does have a bunch of really good songs -- Black Mirror, Keep The Car Running, Intervention and Antichrist Television Blues make the album worth getting. What it's missing, consistently, is the everything-but-the-kitchen-sink sound that powered its predecessor. No longer are we treated to epic compositions of their over-the-top interpretations of Bowie glam riffs, backed by the driving drum-and-base of a New Order dance hit, backed by all sorts of bells and whistles and horns and strings. In some of the songs on the album they seem to be taking a page from other contemporary bands, such as Hold Steady and The Killers, by channeling Bruce Springsteen -- at least vocally. Or, more precisely, they sound like Eddie and the Cruisers, the fictional movie group from the 80's that evoked The Boss. There is nothing wrong with Springsteen (or Eddie and the Cruisers.) It is just a weird place for Arcade Fire to be. Like Arcade Fire, Springsteen makes serious music. But he can also be subtle and clever and, yes, ironic. Which is why his albums are generally successful from start to finish. Arcade Fire can be none of these things. They are the very embodiment of the phrase "go big or go home." 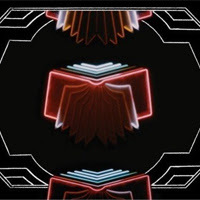 All too often on Neon Bible -- an album which has its moments -- I wished Arcade Fire had stayed home.